Some people look for summer thrills in surfing or skydiving. Not me. I get excited when I read new writers and have a chance to recommend a good Russian book on my blog. So here you go: Rasskazy: New Fiction from a New Russia, an English-language anthology of very contemporary Russian stories. After reading about a third of the stories in Rasskazy, paging through the rest, and reading author bios, two thing have struck me: the unusual readability of the translations and the variety of the writers’ topics and styles. I’m pretty tough to please when it comes to translation, but the stories I’ve read only in English read naturally, normally. Meaning I could read in peace without wondering what I was missing. When I’ve read stories first in Russian then in translation (or vice versa), the translations reflected the vocabulary and tone of the originals. I think Rasskazy’s varying voices on Russian life are a big part of the book’s fun and appeal. I pick, randomly, at anthologies rather than reading them cover to cover and have been welcoming the element of the unexpected in Rasskazy. Today: a dog named Ivan Denisovich who likes pel’meni in Oleg Zobern’s “Bregovich’s Sixth Journey,” translated by Keith Gessen. Who knows what I’ll find tomorrow? I’ll write more about specific stories in September. Note: This post is the first in my “Notable New Translations” category. My plan is to write more about new translations because they, their publishers, and their translators never seem to get enough attention. I encourage publishers, writers, and translators to tell me about upcoming translations so I can work them into my reading, if possible, and the blog, at the appropriate time. Sadulaev, Take One: German Sadulaev’s new novel A.D. gets off to a promising start, lamenting winter holiday overload and letdowns. (Sign me up!) Sadulaev quickly segues into a description of an office holiday party at a casino: the advertising director playing Dionysus, people drinking too much and sneaking into dark corners. A scream breaks up the party when the boss is discovered, dead in the men’s room, victim of a fork to the heart. With the initial decadence and death, plus the fact that the Russian word ад (ad) means “Hell,” A.D. sets itself up from the start as a carnivalesque thriller-detective sort of novel with a few twists. Russian critic Lev Danilkin writes on Afisha.ru that A.D. ends up in smoking ruins, and he gives the book the distinction of being “один из самых уникальных случаев саморазрушения в литературе…” (“one of the most unique instances of self-destruction in literature…”). Alas, I can’t disagree. I attribute that problem to a lack of motion in the book. If a novel never really goes anywhere, it’s tough to write a logical ending. Only one plot line moves much: a somewhat hardboiled investigator, Kataev, a bachelor who loves creating meals out of frozen foods after a borshch-soaked childhood, investigates the murder. But the other characters seem to exist for Sadulaev to stuff their mouths with dialogue about gender, duality, and philosophy, to augment Kataev’s research into intersexuality. It feels as if Sadulaev wrote “content” rather than characterizing or plotting, and the result is a lot of material, some of it moderately funny, that ends up feeling devoid of context and, ultimately, literary meaning. The book also contains a passel of office words borrowed from English plus numerous cultural references, some satirical… Dale Carnegie (again! ), Christopher Hitchens’s article for Vanity Fair about Mother Teresa, the Russian musical group ВИА Гра (VIA Gra) known here as “Фуa-Гра” (Foie Gras, get it? ), and many others are all here. All told, though I found A.D. pretty disappointing, it was a fitting diversion in a hellish heat wave. Sadulaev, Take Two: Tin House’s anthology Rasskazy: New Fiction from a New Russia, edited by Mikhail Iossel and Jeff Parker, contains an excerpt from Sadulaev’s book Я – чеченец! (I Am a Chechen!). I think I would describe the excerpt, “Почему не падает небо” [page down to find this piece of the text] (“Why the Sky Doesn’t Fall”) as a stream-of-consciousness piece that feels like fictionalized memoir as it describes the destruction of lives, families, and property during the Chechen War. “Why the Sky” is at once lyrical, mystical, and political, and its characters, despite small roles, feel far more memorable than anyone in A.D. because Sadulaev writes here about things that hurt. Anna Gunin’s translation captures the original’s combination of dreaminess and harsh reality. Rasskazy’s brief bio of Sadulaev mentions that Harvill Secker will publish I Am a Chechen! in the U.K. in 2010. Amazon shows its release date as January 6, 2011. I’ll be writing more about Rasskazy over the coming weeks. The book contains an interesting mix of stories by young authors, including Zakhar Prilepin, whose short story collection Грех (Sin) I liked so much, and several other book prize winners and finalists. Rasskazy will be released September 1, 2009. Why it’s important: Very modern-feeling prose presenting events out of chronology told by varying narrators. The title has become an inescapable phrase for era-specific anti-heroes, and there are many literary references to Pechorin, the ennui-drenched title character. Vladimir Makanin’s Андеграунд, или Герой нашего времени is one of the most obvious contemporary examples. First, a brief summary: Lermontov uses five stories of varying provenance and genre to tell of Pechorin’s escapades in the Caucuses. This thin volume includes abduction, cultural differences, moody nature descriptions, death and a duel, a mermaid, people taking the water cure, various forms of deception, and much more as Lermontov exposes Pechorin’s lack of morals. Pechorin is world-weary to an extreme, bored and cynical, so there is frequent yawning and shoulder shrugging. Pechorin is a thoroughly reprehensible person – he even kills a horse by riding too fast – who frequently mentions his moral shortcomings but never seems to regret them. I doubted his sincerity and trustworthiness as a narrator, perhaps because he is something of a charmer at times. (Of course he is also, thanks to Lermontov, an excellent writer.) There is a reference or two to Lord Byron in Hero, and Pechorin is also a relative of Pushkin’s Evgenii Onegin. Victor Terras points out in A History of Russian Literature that both names spring from Russian bodies of water. My favorite story is “Princess Mary,” no surprise since it’s the longest (70 pages) piece in Hero. “Princess Mary” is Pechorin’s diary at the waters, and he writes of romantic rivalries, displaying caddish treatment of women and a frequent disregard for the truth. Yes, the plot turns are very predictable, but Lermontov makes them so enjoyable through Pechorin’s vinegary first-hand accounts that these old stories – written in 1838-1840 and filled with stock characters – feel almost contemporary. Nabokov notes the energy and rhythm of Lermontov’s storytelling, and I think that’s what I found so compelling, too, both times I’ve read the book. It feels like Lermontov was absolutely driven to write this book. And I felt driven to keep reading it, whether I was at the beach or in a soft chair. Lermontov’s understanding of psychology is another factor: even if he’s a composite, Pechorin seems so real that it’s easy to see why readers thought Lermontov was writing about himself. I also enjoyed hearing the voice of Maksim Maksimych, in whose home Pechorin stays in “Bela.” Maksim Maksimych, whose patronymic tells me he’s a man of tradition, clearly feels affection for Pechorin, so one moment stands out in the book as particularly sad. When Maksim Maksimych and Pechorin find themselves in the same town and Pechorin finally arrives for a meeting, Maksim Maksimych reaches to hug Pechorin, but Pechorin can only cough up a smile and a handshake. A Hero of Our Time is an indispensable part of any Russian literature reading list: it’s important for its structure and storytelling techniques as well as Lermontov’s famous portrayal of Pechorin. I also think it’s a lot of fun to read. To draw on Nabokov’s comments once more, A Hero is particularly remarkable because, to paraphrase crudely, the book was written when Russian prose was still a toddler and Lermontov himself was only 25. And a brief note: The Russian word “герой” translates into English as both “hero” and “main character,” giving the book’s title a nice ambiguity. It’s too bad Christopher Hitchens didn’t know that when he wrote this piece for The Atlantic. 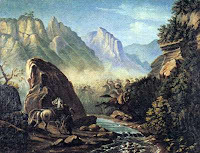 Painting: Lermontov's "Перестрелка в горах Дагестана" (A Skirmish in the Mountains of Dagestan), 1840-41, via Wikipedia. Now’s your chance to test-read The Wall in My Head: Words and Images from the Fall of the Iron Curtain, an anthology edited by Words Without Borders and published by Open Letter Books. The book includes fiction, essays, documents, and a wide assortment of images. 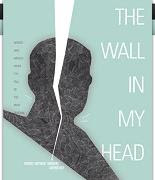 The Wall in My Head is scheduled for release on November 9, 2009, but galleys are available free online here for a limited time. -The Words Without Borders Web site includes a number of pieces translated from Russian. -Open Letter will be publishing Konstantin Gurevich and Helen Anderson’s new translation of Ilya Ilf and Evgenii Petrov’s Золотой телёнок (The Golden Calf) in December 2009. Just to be clear: Mikhail Elizarov’s novel Библиотекарь (The Librarian) has absolutely nothing to do with our beloved institutions that offer books and other reading materials to the public. There are no dusty stacks, shushing librarians, or magazine racks. Meaning that, right from the title, the reader gets a big dose of остранение (defamiliarization) – the concepts of “librarian” and, really, “reading” have left the building. Elizarov’s Librarian is one of the most fun(ny), sad, suspenseful, and peculiar books I’ve read in a long time. His librarian, Aleksei, narrates, describing how he goes from a lousy start on an entertainment career in Ukraine to inheriting his Siberian uncle’s apartment and, unexpectedly, leadership of an odd book group. Rival groups fight each other – often to the death using sharp and blunt objects – for possession of books by a hack writer named Gromov, a World War 2 veteran whose Soviet-era novels never became popular. Gromov’s books later win readers not through plot but with mystical powers that, like mind-altering drugs, grant gifts. Нарва (Narva), known as Книга Радости (The Book of Joy), has a euphoric effect, and Книга Ярости (The Book of Rage) was “discovered” by a prisoner. Another book is called Книга Силы (The Book of Strength) – it keeps a group of elderly women lucid, alive, and more than kicking. These nursing home women become a fierce clan, and one uses a crane hook as a weapon. Aleksei’s library possesses Книга Памяти (The Book of Memory), which creates the “mirage” of happy memories. Yes, the premise of The Librarian sounds absolutely implausible. But Aleksei’s unassuming, self-deprecating voice makes it feel absolutely plausible, even if I don’t always believe what the book groups believe. His calm, first-person narrative describes lonely people looking for meaning, companionship, and illusion in an unstable country. (The lack of relatives and social order make it easy for groups to pass deaths off as accidents.) Readers look for meaning in literal ways, too: the biggest prize of the Gromov world is the lost Книга Смысла (Book of Meaning), in which Gromov praised Stalin at the wrong time, a case of myth-making gone awry. That seventh book turns up and leads us to Aleksei’s fate. I enjoyed The Librarian because it compelled me to keep reading and left me with questions. I can’t help but love a novel about a parallel world inhabited by books and their effects on the people who read them… still, I know The Librarian won’t appeal to everyone. The crusade-like battles weren’t my favorite aspect of the book: I think their sadness and frequency bothered me more than the violence, though I found humor in new uses for hockey equipment, pelts, and Soviet coins. The Librarian grabbed me because of Elizarov’s inventiveness in creating a trippy parallel world: he blends magical reactions to books with what we know as reality, incorporating historical, religious, and cultural references. I have to think it isn’t a coincidence that Gromov wrote seven books and there are seven seals in the Book of Revelation. Given all that, I even thought the cryptic and messianic ending – which effectively freezes time for Aleksei at Pokrov, the Feast of the Protection, in October 1999 – seemed logical, despite its ambiguity. I won’t write specifically about the crypticness or ambiguity because I don’t want to ruin the ending for those who may read the book, either now in Russian or later, in translation. (Serbian and French rights have been sold.) But I will say this: I think the ambiguity is tied to the book’s references to illusions and the past. Maybe I’m a materialist, but I find a cautionary tale rather than glorification of the Soviet past in The Librarian. I didn’t find much worth romanticizing in the world of the libraries beyond, perhaps, the relationships Elizarov mentioned in his interview. Those friendships, though, are underpinned by violence and all sorts of illusions, meaning I think the characters choose paths that, to expand on a Russian saying, take the sweet lies of myth and mysticism over the bitter truth of reality. Work and Date: Мелкий бес (The Petty Demon), dated June 19, 1902, in my book. Why it’s important: A classic novel of Russian symbolism or decadence (your choice!). The unpleasant traits – general loutishness, corruption, and lack of morals -- of the main character, Peredonov, inspired a new Russian word, передоновщина (peredonovshchina or peredonovism). Background information and criticism: Time magazine’s review dated September 7, 1962, gives a decent summary of the book. Andrew Field’s translation, which Time was evidently reviewing, includes a helpful introduction and background notes. Searching on Google or Google Books for Sologub and “petty demon” brings up a fair bit of academic criticism, and first pages on JSTOR (e.g. Murl Barker and Harry Snyder) provide a good sampling of critical thought about the book. I loved The Petty Demon when I read it 20 years ago in grad school, and I loved it so much this time around that I didn’t want to finish the book. And what’s not to love? A book about the sacred and profane that includes literary allusions, puns, and a suspected hex or two, plus tragicomic portrayals of provincial пошлость (poshlost’, a combination of vulgarity, banality, and ignorance) is my kind of book. Plot basics: Peredonov, an anti-intellectual, cruel, and paranoid schoolteacher, wants to be promoted to school inspector. His girlfriend Varvara, who has the body of a nymph and the head of a sinner, tells him that if she marries him, a princess will get him the inspector job. Peredonov and Varvara are a fun pair: in their leisure time they enjoy drinking and tearing at the wallpaper to irk the landlady. Meanwhile, one of Peredonov’s favorite students to abuse, the androgynous Sasha, becomes involved with the older Liudmila, a lover of perfume, clothes, and beauty who calls herself a pagan and also loves church rites and the crucifix. The miracle of The Petty Demon is that Sologub so skillfully combines humor with drear, including Peredonov’s fear and toska, that horrible Russian longing that resembles angst. When he’s not inflicting physical or psychological pain on someone, Peredonov is capable of wandering around in a state where he feels that nature is reflecting his toska and fears, though Sologub writes that Peredonov misses out on the more Dionysian and elemental aspects of nature because, essentially, he sees only his own pettiness. Sologub concludes that paragraph by writing: “Он был слеп и жалок, как многие из нас.” (“He was blind and pathetic, like many of us.” (translations are mine)) Moments like these, where Sologub sets aside the more grotesque realism displayed in much of the book, felt particularly symbolist to me because they contrast the earthly “here” with something more mystical and spiritual. Then he wonders if he did the right thing to send it. Sologub soon compares Peredonov to a corpse, and a bit later Peredonov sees the princess as the queen of spades or hearts and tosses a deck of cards in the fire. (Subtext alert: Pushkin’s “Queen of Spades”) Yes, Peredonov’s paranoia extends to inanimate objects: his history also includes writing denunciations of queen cards and, in a fit of pique, he hacks up a table because his nemesis – the недотыкомка (nedotykomka, an untouchable or unproddable thing), his personal petty demon of an apparition – was hiding there. Peredonov’s use of words is often hurtful, which feels particularly significant in a symbolist novel. To be sure, he’s hardly the only gossip in town: everyone thrives on rumor and clichés Sologub calls dead words. Peredonov’s nasty gossip contrasts with the poetry he claims to like, but his respect seems limited to possessing pictures of Adam Mickiewicz and Pushkin. Of course the Pushkin picture’s place is in the сортир, the bathroom or outhouse. Peredonov also doesn’t seem at all familiar with Chekhov. I could write much, much more about lots of things, like religion and literary allusions, but I’ll limit myself to a few of Sologub’s names – Peredonov seems rooted in remaking Don, as in Quixote, and other names, some Gogolesque, have significant roots: Skuchaev (boredom), Khripach (wheeze), and Pyl’nikov (dust). I also want to briefly mention the decadent Liudmila’s corruption of Sasha’s youth, which [Spoiler warning!] crescendos at a masquerade party where Sasha, dressed as a geisha, wins the costume prize for women. The crowd then tries to unmask Sasha but an actor saves him – yes, an actor, a person whose job is to be masked – by carrying him out and not revealing his identity. The Petty Demon is a little-known Russian classic that presents a dim but very funny view of humankind’s inability to appreciate knowledge, beauty, and the divine. Although Sologub stuffs the book with plenty of characters, events, and, yes, symbols, the novel never feels too heavy, either in volume or in theme. Sologub said in the introduction to the second edition of The Petty Demon that he wrote the book about his contemporaries, but the book still feels awfully relevant in the 21st century. 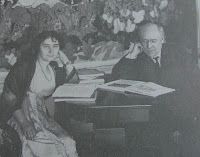 Photo by Karl Karlovich Bulla: Sologub at home with his wife, Anastasiia Chebotarevskaia, 1910s.